Nikon D850, 14-24mm ultra wideangle lens, f/11, ISO 100. Autumn is the time in my photographic calender I enjoy the most. It’s the height of the fungi season, the diversity of colour in the foliage, and the assemblage of leaves that carpet the woodland floor add an extra dimension to the landscape and your photographs. 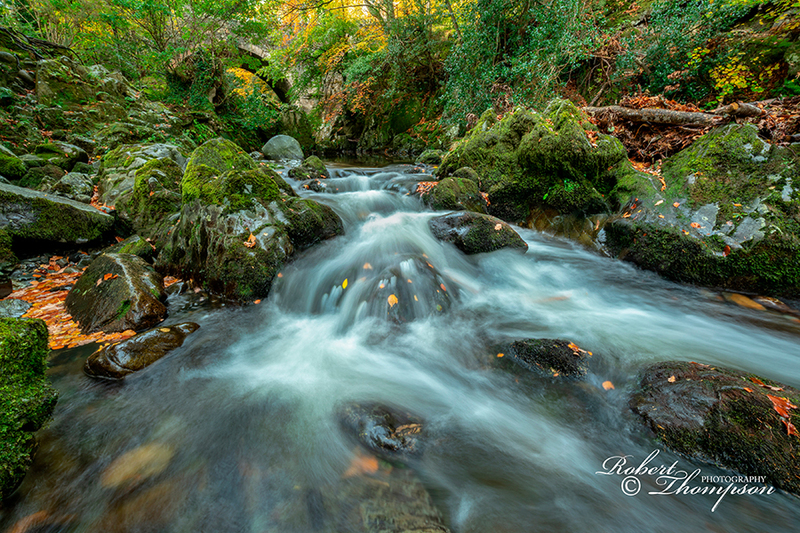 Recently I was commisioned to produce a series of autumnal images of the Shimna River, within the catchment area of Tollymore Forest, but avoiding the well published hot spots such as the Stepping Stones and several others along the river that habitually attract the photographic herd. The Shimna is a small, fast-flowing spate river, rising and falling quickly depending on the rainfall and therefore not that exciting as rivers go. In drier periods where the gradient is low the water pools exposing rocks and sandy areas making it challenging to photograph at other times of the year. The river rises from the slopes of Ott Mountain in the northern part of the Mournes. The river enters Fofanny Dam making its way in a northeasterly direction passing through Tollymore Forest where it picks up the tributaries of Spinkwee and Trassy rivers and finally making its exit at Newcastle. The flora and fauna of the region are not that remarkable although it does have an ASSI designation (Area of Special Scientific Interest) based on the mosses and bryophytes communities that exist within the area. Nikon D850, 24-70mm wideangle lens, f/11, ISO 100. 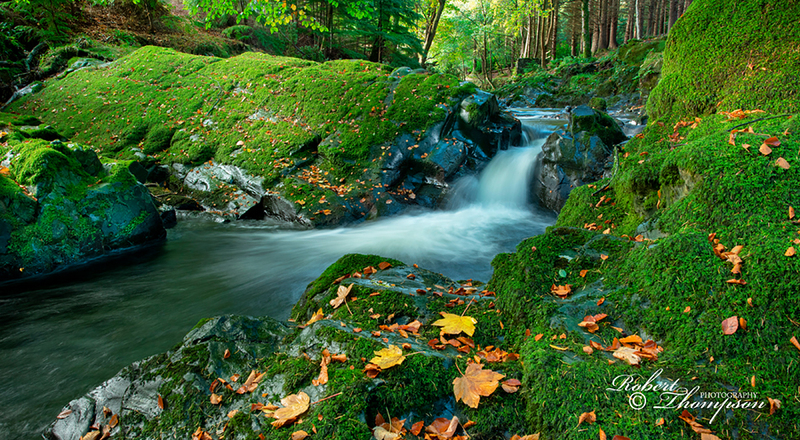 I have, over the years, made many trips to Tollymore working on many different contracts and projects. A number of these have been centred around documenting the Lepidoptera (mainly moths), and the lichen and fungi communities; the latter being less evident in recent years due to a number of factors. The most concerning of these is the increase in collecting which has had a severe impact on the fungal flora within the woodland. 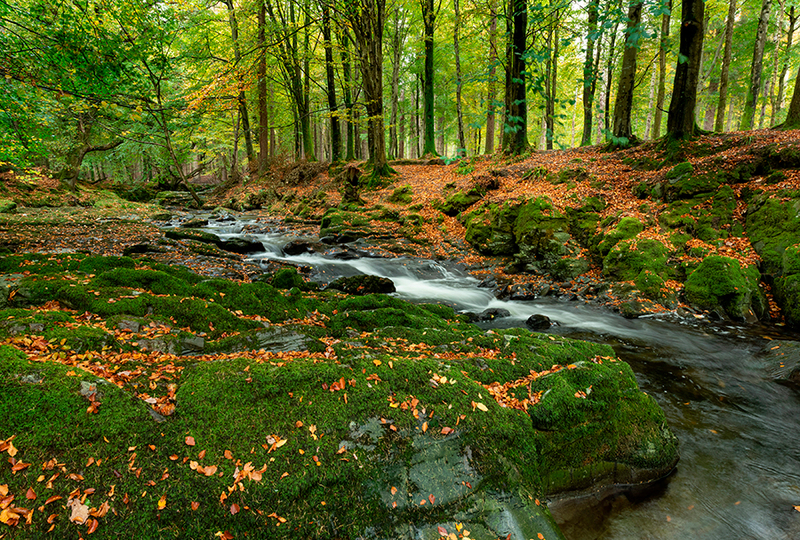 It’s not only Tollymore that has suffered, but several other well-known fugal hot spots are under threat as well. I have witnessed the indiscriminate collecting many times, and the tragedy is that the majority of species picked get discarded. 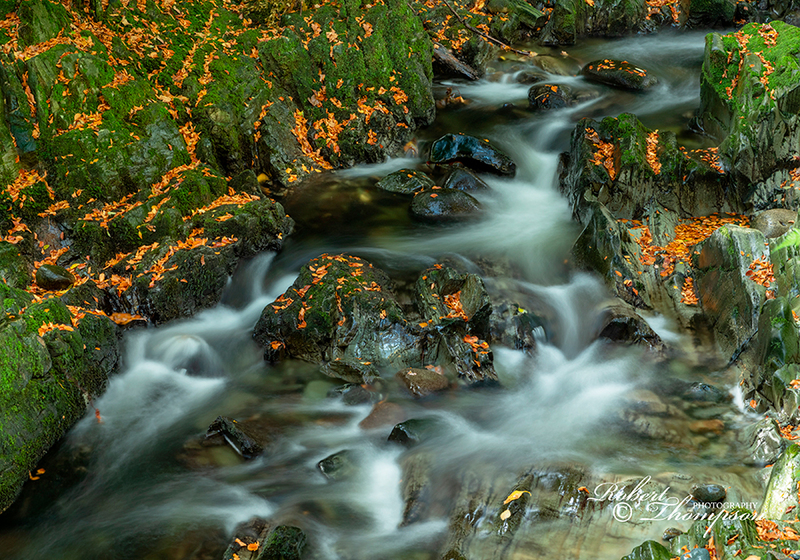 Autumn is perhaps one of the best seasons in which to show this river glen at its best. It is relatively unremarkable in photographic terms at other times of the year. 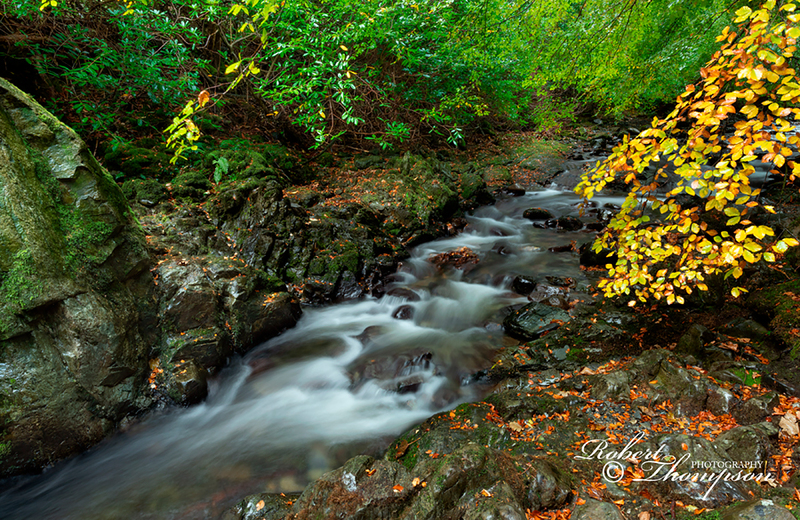 Tollymore is reasonably close to my home, and an ideal location when I want to experiment with new ideas, or when I want to appreciate its beauty or pursue my own agenda. I only had a small window in which to complete the task. The weather was far from kind during most of the week. Having not been able to get a suitable day without a stiff breeze accompanied with very heavy pulses of rain, I was forced into the weekend; a time I try to avoid since the park will be at its busiest with people and walkers. I was also in danger of missing the autumnal peak which has a relatively short window. I was due to head away the following week on another project but did not want to miss the best of the flush of colour. The wind had moderated somewhat on Saturday, but the weather forecast had indicated conditions were unlikely to improve significantly in the following couple of days. Sometimes you just have to take a chance! Having decided to risk it, I arrived and sat in the car park for 45 minutes before the rain subsided. I had studied the maps the previous evening (even though I know the area well) looking at the path of the river reminding myself of areas that might be worth exploring. I don’t as a rule work blind on any project or contract; you waste so much time pursuing places that turn out to be unproductive. Proper preparation is essential in this business. Having arrived at the river basin, I had mapped out a route with several promising locations. Most people head for the river walk, the majority turn right and head along the path upstream. I naturally turned left heading away from the masses with the intention of exploring several areas downstream which is less frequented by people. By now the rain was back, and thick, dense cloud was dominating the sky as far as one could see. Looking at the river my initial thought was that the flow was quite weak considering the rain we had. I was concerned that there would be little water at all over the larger cascades. However further downstream in deeper areas, it did improve. Nikon D850, 24-70mm wideangle lens, polariser f/11, ISO 100. Another reason for getting out was to test a new wireless electronic release system from Hahnel; I was fed up replacing wired electronic cables that connect into my Nikon GP-1 unit. The Hahnel units are not a cheap system, but I wanted reliability and to be cable free. The first problem I encountered was the Nikon GP-1 did not work with the Hahnel unit despite being told that it would. It is essential that I use a GPS unit in my work and Nikon’s GP-1 was very much an afterthought by them. The problem is, it needs the ten pin socket which means you can’t use it for a wired release and you have to buy a different cable that inserts into the GP-1 unit; not a great idea in my opinion. What they should have done is include an accessory terminal on the front of the connector like a few other GPS companies have done. In fairness, the wireless unit was working correctly when not connected via the GPS, so I figured it was time to replace the GPS unit too. I had been thinking for a while that the new Di -GPS Geotagger Eco Professional 2 including a compass direction indicator was the way to go. Apparently, it is much faster at locking on to satellites, and it had a dual ten pin socket. I ordered it from a camera company in Germany, and it arrived in 3 days. Hahnel did send me another cable very quickly, and it did work to a point with the Nikon GP-1 but not consistently. Having used the Geotagger unit along with the Hahnel wireless release system for a while, I have to say it’s worked flawlessly in all situations. Nikon D850, 24-70mm wideangle lens, polariser f/11, ISO 64. Despite the overcast conditions, I did locate some interesting spots along the river. Some of them being a little risky and somewhat difficult to navigate in wellies. But the most promising locations are always the furthest, or the most problematic to reach. Despite having to deal with heavy intermittent rain, I was reasonably happy with the results some of which I have posted here.